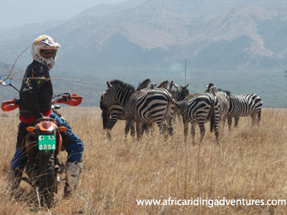 Africa Riding Adventures Tours is the only motorcycle tour operator in Ethiopia providing you with the unique opportunity to experience the vastness, wilderness, culture and history of Ethiopia on a state of the art KTM motorcycle. If you would like to combine your Ethiopia Adventure with a trip to Uganda, Sudan or Kenya we can also organise it for you! Africa Riding Adventures Tours was formed by experienced rider and well travelled Flavio Bonaiuti, who has spent the better part of 2003 exploring and mapping hidden trails and far-off corners of Ethiopia. If you are looking to test your stamina and skills on a motorcycle look no further! No matter what your experience or skill level is, there is no better place to do it than Ethiopia and no better bike than a KTM. Come and join us for the adventure of a lifetime! Africa Riding Adventures offers three models of motorcycles in its tours: KTM 640 LC4 Enduro, KTM 690 LC4 Enduro and KTM 525 XC Desert Racing. Our bikes are expertly maintained and thoroughly serviced after each ride. We are also KTM official importers, so trust us. You will have the best possible support you can get! Design a tour based on your own personal requirements: choose the dates you want to ride with us, difficulty level, a more tourist or off-the-beaten-track route, a more ethnic, historical or scenery focused tour or simply the sites you want to visit. If riding is your first priority, no problem. Tell us what you enjoy the most: mix of road and off-road riding, a more technical ride? We will try our best to accommodate all your wishes and send you one or more itineraries to meet your desires. Our custom made tours have no minimum number of days or riders but the maximum number of riders is 6 for safety reasons and to allow for a more personalised service. In this unforgettable tour, you will take a deep plunge into Ethiopia's unique history. The historical route through Northern Ethiopia will take you through the country's most famous attractions, such as Lalibela's famous rock-carved churches and Gondar's 16th century castles and churches. Spend Christmas day in Lalibela and witness the first pilgrims arriving for the commemorations of the Orthodox Christmas on the 7th of January. New Year eve will be spent in Gondar one of the main tourist attractions on the northern historic route where you are certain to have a good time. This motorcycle tour is not for the faint of heart - this is the ultimate adventure! If you want to test your stamina and riding skills, there is no better place on earth than Ethiopia and no better destination than Danakil! Ride through stunning scenery, extreme temperatures and challenging road surfaces whilst discovering the magnificent landscape of Ethiopia. Be one of the few to ride in the hottest place on Earth. We cannot promise you an easy ride - but we can promise you the ride of a lifetime! This very unique route to the north will take you on a speedy visit to the most well known historical attractions of Ethiopia. If your main objective is to have a memorable ride in great off-road tracks but at the same time you would not like to miss the most well known sites of Ethiopia's history this is the tour for you. A fair warning: with the exception of the rock hewn churches of Lalibela you will not have the time to visit or see any of the attractions in depth, but boy will you have fun! Welcome to southern Ethiopia! If you want a taste of Ethiopia's numerous ethnicities and wildlife, this is the right tour for you. Arba Minch is the place to enjoy wildlife - in the Nech Sar National Park and Chamo Lake, including one of the most spectacular displays of big crocodiles and hippos in Africa. During the next stops in Jinka, Turmi and Konso, you will meet some of the most fascinating tribes in the country and become acquainted with their customs and traditions. Ride up close and personal with some of the wildlife and enjoy some great off-road tracks. If you're pressed for time and a 2 week motorcycle tour to the south is just too long maybe this 10 day tour will make the trick. This short tour takes you as far as Negele Borana, south of the Bale Mountains National Park from the inside roads. The off-road is really great with fantastic tracks taking you from one tribe to another or from everchanging landscape to your next overnight. A fantastic off-the-beaten track route taking you through some of the best the South of Ethiopia has to offer! Get ready! This is a unique trip to two of the least visited and accessible parks in Ethiopia: the Omo and the Gambela National Parks. Tourism infrastructures are almost inexistent in the Parks, therefore for accommodation we will rely almost exclusively on camping. This tour will take place during the rainy season and although rainfall is supposedly low in August you will still need to come prepared to do some riding on wet pavement/tracks at least until we reach the park. This is a really tough ride and we will only accept bookings from very experienced off-road riders. An adventure motorcycle tour in the true sense of the world. Come prepared for the unexpected. If you just want a fun weekend break or are on a short visit to Ethiopia a two-day tour may just be what you are looking for. There are many great rides and fantastic locations to visit within two days of Addis Ababa. In addition, if you take your two-day tour during the weekend you are entitled to special prices. Check our weekend tour schedule and book for the dates that are most convenient for you or contact us for a tailor-made tour or prices for a different number of riders. Africa Riding Adventures Tours understands that you may prefer to ride your own bike in one of our guided tours, therefore we will be happy to help you in doing all the necessary arrangements to make this a reality. Whether you live in Ethiopia, are an independent traveller or would like to bring it from abroad we will make all the necessary arrangements to make your dream ride a reality. Together with all other amenities included in our tours, Africa Riding Adventures will also arrange for the bike to be taken out of customs and be shipped back again to your country of origin when necessary. Motorbike (KTM 640 and 690 LC4 Enduro or 525XC Desert Racing - no fuel), bike insurance against third parties and theft. Satellite phone for use in case of emergency, GPS and medical kit. Semi-inclusive tours include all of the above but no support car; Bike only tours include the itinerary, the bike, the tour leader and mechanical support. AGE RANGE, TYPE OF GROUP On our tours we take individuals, couples, families and participants of all ages. If they don't know, don't want to or can't ride with us (minimum age to ride one of our bikes is 16 if accompanied by a responsible adult; otherwise 18) they may travel in the support vehicle and depending on the route and the rider's willingness even as passengers on the bike. So, feel free to bring your family or friends with you! As a curiosity the oldest rider we had in one of our tours was 74 and he went with us to Danakil! The heaviest was 155 Kg. The bike behaved awesomely and he loved the ride! We are located behind the Hilton Hotel, in the building in front of the Presidential House, between the ECA (Economic Commission for Africa) and the Development Bank, 1st floor right.